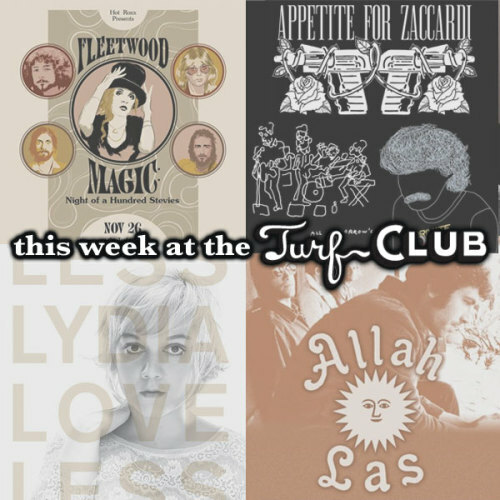 DJ Jen Hughes will be MC’ing the all-local tribute show to the legendary Fleetwood Mac this Wednesday night at the Turf! Performances by tiny deaths, Red Daughters, Just Perfect (aka Brian Just Band), and Invisible Boy and Co. (featuring members of Polica & Heavy Deeds). They will be paying large tribute to the influential London rock group fronted by Stevie Nicks and John McVie. Their second album, Rumours is a staple of any best album list out there, being the sixth most popular album of all time. Even if you caught their Target Center gig in September (and especially if you didn’t), it will be a night to remember for any Mac fan, hearing their unmistakable tunes inside a smaller venue, like the venerable Turf! Known for their wide-reaching and expansive playlists, Staraoke will be taking over the Turf Club this Thanksgiving night (The club will open at 6pm on Thursday). Staraoke is a forum for any music fan to be able to belt out the lyrics to some of their favorite tunes unabashed and unashamed, led by longtime host Arzu Gokcen, who wants you to do just that. Sick of karaokes that place too much emphasis on the singer, often causing some nervousness to take over, Staraoke works to resolve that, making any punk cover sound like a real punk band on stage, same goes for pop songs, rock songs, and even hip-hop. For those seeking post-Thanksgiving dinner plans, Staraoke at the Turf has you covered. Come work off the turkey weight! We’ll be hosting some of our favorite local artists this Friday at the Turf to perform songs by some past rock stars, who unfortunately aren’t likely to be playing the Turf anytime, in the near future. These rock collectives prefer to consider themselves a large bunch of friends getting together on stage, playing some of everyone’s favorite tunes from these classic groups (theirs and yours) while you (and them) get to kick back and have a drink. The atmosphere created brings a very laid back feel to what would normally be a packed Xcel or Target Center reunion show. Stop by the Turf this Friday night and hear some of your favorite songs from Guns N Roses, Tom Petty, and Hall & Oates performed by some of the most talented musicians in the Twin Cities. The lovely Lydia Loveless will be blessing St. Paul audiences with her gorgeous alt-folk tunes Saturday night at the Turf. This Columbus native grew up in rural Ohio, a strong influence into her current music, and has since found a touring band after being exclusively with family members previously. Singing and writing since age 12 explains her confidence and amazing stage presence at her shows. She is not the cookie cutter folk rock star one may imagine, however, crossing over into punk territory frequently. Her full band has only complemented her live set, making waves amongst critics for having the ability to take an audience on a rollercoaster of emotions and tug at your heart and send you into rock n roll bliss simultaneously. Catch her headlining the Turf this Saturday! Los Angeles group Allah-Las will be rocking the Turf Club next Monday night, bringing their West Coast garage rock to the Twin Cities for their first headlining gig, previously supporting acts like The Black Angels and Nick Waterhouse (who produced their debut release) in the past few years. Their second release, Worship the Sun has caught the attention of many fans and critics alike— opting for a more formal recording process than most DIY indie rock artists of the same area. Working at the famous Amoeba Records in L.A. is how three of the four members met, Allah-Lahs have put in some serious studio time perfecting both of their exquisitely produced records, opting for a 1960’s garage rock feel— making the listener assume it was thrown together in a few days. On the contrary, both releases can be more appreciated upon repeated listens to fully appreciate the labors implemented into their dark-surf-garage-punk sound.